Well we have had a couple of climbing roses so far in this series, so I think it’s time for a shrub rose. One of my favourite types of shrub roses has to be the Moss roses, with their soft sticky fragrant moss like growth around the buds, have a special place in my heart. They take me back to the hours of spent bloom removing, with the moss roses, leaving their spicy sweet scent on my hands for days after. The Moss roses are a sport of the centifolia rose, with the mossy growth is really the enlargement of the glandular projects over the flower stalk and bud. Jeanne de Montfort was bred by Monsieur Robert in 1851. 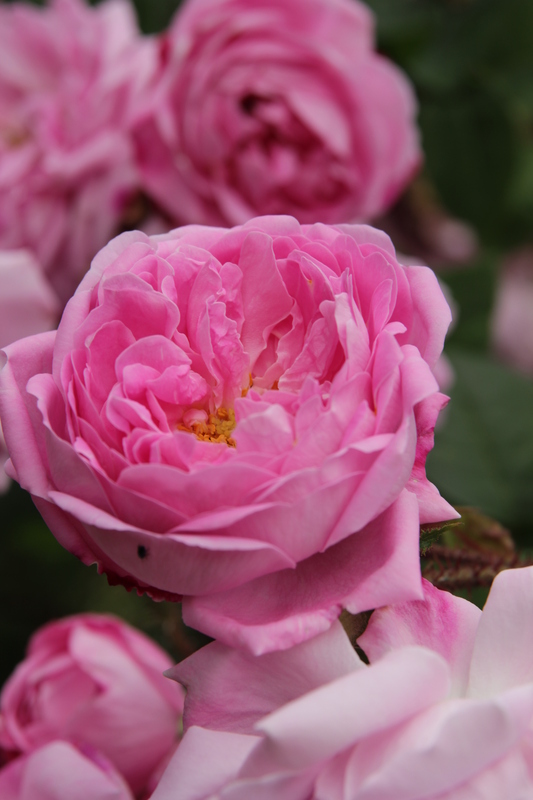 Robert worked for the famous rose breeding family Vibert, from which he took over the nursery in Angers around 1851. It is one of the taller Moss roses, reaching a grand height between 6-7ft in height, not quite as vigourous as ‘William Lobb’. The clear warm pink beautifully scented flowers are borne over shiney green leaves and soft browny/red thorns and mossy growth. The flowers have their main display in June but also will sometimes flower later on in the season as well. Does suffer a little with foliage problems like most roses but information to treat them can be found here. But who on earth is Jeanne de Montfort and why is she named after a rose? Well Jeanne de Montfort was born in 1295, her father was LouisI, Count of Nevers and she married John of Montfort in 1329. In 1341, the Duke of Brittany JohnIII sadly passed away, being childless, there was no clear accession to the throne and this lead to the War of Breton Succession (thought to be the start of the 100yr war between England and France) between the Montfort and Blois family. After her husband was captured, Jeanne donned on a suit of amour and carried on the fight in her families honour, she enlisted the help of the English during some of the battles and to break the siege of Hennebout. She became well know as a very good military leader and a good fighter even during hand to hand combat during a sea battle on the way to England. After her husband was killed in battle in 1345, she became the leader of the Montfort family. The was continued but she moved to England and the fight was carried on by English lords on her behalf. Although she came to England as a heroine, she was conifined to Tickhill Castle on the Nottinghamshire/Yorkshire border by King Edward III, mainly to increase his power in Normandy. She sadly passed away in 1374. She has been discribed by mainly people as having “had the courage of a man and the heart of a lion”, thought to be a heroine of Joan of Arc and was a role model for Victorian feminists. The folktales of her life are still told in Brittany today.